Your home is what you make of it, but we’ll give you a pretty incredible place to start. 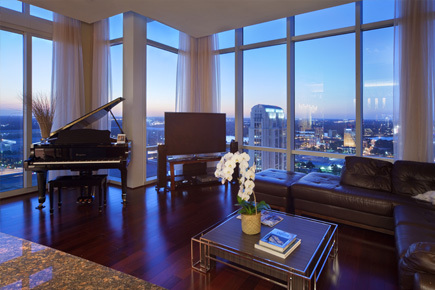 Ceilings up to 20 feet and floor-to-ceiling glass will ensure plenty of light and a beautiful view of the Orlando skyline and Lake Eola, which you can enjoy from your private balcony. And beneath your feet, it’s hardwood flooring in the living room, dining room and kitchen, with luxury carpeting in the bedrooms. Each unit also comes with acoustical treatment between floors, 6-12” of poured concrete between each unit, a washing machine and ventless dryer.